PIERROT è un progetto di filosofia e arti performative che nasce attorno ad un concetto fondamentale del pensiero filosofico di Gilles Deleuze, l’automate spirituel (automa spirituale); questo concetto, questa figura, scaturisce a sua volta da alcune riflessioni di Deleuze attorno le figure e le opere di Baruch Spinoza e Antonin Artaud. Il progetto si è articolato inizialmente in una residenza di creazione artistica ospitata nelle sale della biblioteca del Museo Nitsch di Napoli nei mesi di gennaio, febbraio e marzo 2011; a chiusura della residenza, si sono svolti poi alcuni seminari e work shop relativi ad alcuni materiali filosofici e artistici elaborati nella residenza stessa, in collaborazione e con il sostegno di altre strutture della città di Napoli, (Fondazione Morra, E-M Arts, Aporema onlus), impegnate da anni nella diffusione e nella promozione dei linguaggi del contemporaneo. Che cos’è l’automa spirituale secondo Deleuze? E’ il “testimone dell’impossibilità di pensare che è il pensiero, testimone del mondo imbecille delle immagini”. Deleuze avanza questa sua ipotesi all’interno del suo volume Cinema 2 L’immagine-tempo, confrontandosi con le teorie sul cinema di Antonin Artaud ed intravedendo nel rapporto con le immagini una vitalità per il pensiero per crearsi altre strade per la sua sopravvivenza in un mondo della “banalità quotidiana” che rende “intollerabile” qualsiasi ipotesi di “legame uomo-mondo, amore o vita”; pensiero come presa di coscienza della sua impossibilità, ma che rende possibile il pensare alla sua impossibilità, il suo continuo auto-generarsi sempre daccapo, questa sua tenace volontà di mettersi in vita, di crearsi un mondo accanto al mondo della perpetua banalità del quotidiano. E l’automa, in questo suo esser testimone, è il portatore di questa possibilità, di questa ipotesi di mondo . Rileggendo l’Etica di Spinoza, Deleuze, riafferma questa messa in crisi del pensiero e lo fa sottolineando come le idee non sono un nostro prodotto, ma solo il succedersi, come le immagini banali di cui parla Artaud, di idee in noi, (in quanto noi stessi automaton, costrutti di idee) che si affermano in noi e da queste idee dipendono “nietzscheanamente” la nostra potenza di agire nella vita. 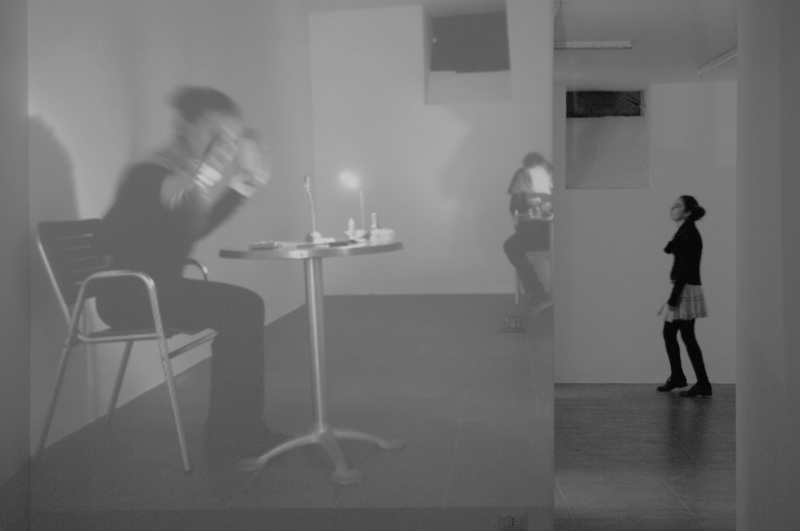 PIERROT is a project in the field of philosophy and performance arts that takes inspiration from a fundamental concept of the phylosophical idea of Gilles Deleuze, l’automate spirituel (the spiritual automaton); which, in turn, arises from Deleuze’s interpretation of the work of Baruch Spinoza and Antonin Artaud. At a first stage, the project consisted in a artist-in-residence hosted in the halls of the Library of the Museo Nitsch in Naples between the Months of January and March 2011. At the end of the term of residence there were held several workshops and seminars related to the philosophical and artistic matherial that was produced during the residency. This was done in collaboration and with the financial support of other bodies (Fondazione Morra, E-M Arts, Aporema onlus), committed to encourage reflection on the contemporary arts since many years. What is the spiritual automaton all about according to Deleuze? It is a "symbol of the impossibility of thinking, represented by the thought itself, the symbol of this ridicolous world shaped by the power of images”. Deleuze introduces this concept in his work Cinema II by dealing with the film theory of Antonin Artaud and by seeing in the relationship with images a possibility for the thought to create alternative courses in order to survive , to the spiritless, material world that the human kind has fabricated which makes intolerable any kind of "relationship between human beings and reality, love or life itself”. The thought is here conceived as the realization of its impossibility, which though makes it possible to figure out its impossibility. Its continous self-generating from behind, this tenacious will to make life, to create a reality beside the world of perpetual banality of the dayly life in which we are stucked. Thus, the automaton is the bearer of this possibility, of the idea of this alternative world. Through the reinterpretation of Spinoza’s Ethics, Deleuze reaffirms this conception and enphasizes how ideas are not our product, but, similarly with the banal images evoched by Artaud, only successions, coexistences of ideas, in us, by this meaning that we are spiritual automata since it is less we who have the ideas than the ideas which are affirmed in us. It is ultimately upon this ideas that, in a “nietzschean conception", is based our power to act in life.